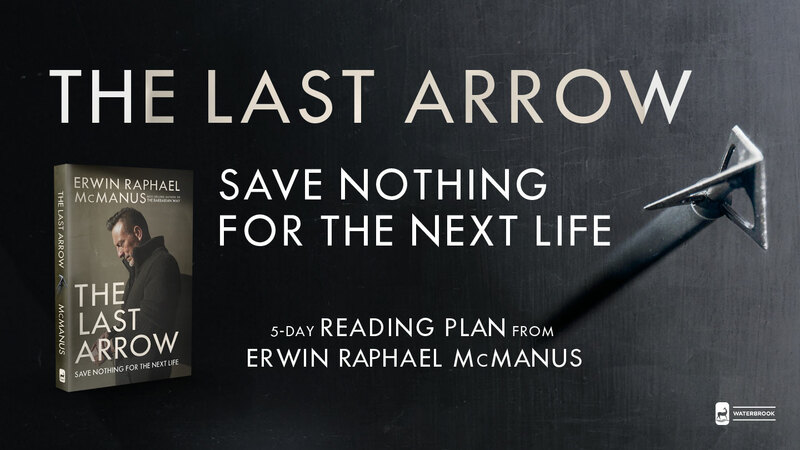 Last year, Pastor Erwin McManus wrote this book called The Last Arrow. After hearing him speak at Hillsong Phoenix about the book during a worship event, I read the book and was really blow away by the content of it. We decided to do a five week study on it in our Young Professionals group this month. Below are my notes from the lead-in sermons for the book that Erwin did at Mosaic church and a five-day devotional plan from Bible.com. Also included are some of the promotional material we created for the our upcoming series. Each week I’ll post my notes from each chapter. I eagerly expect and hope that I will in no way be ashamed, but will have sufficient courage so that now as always Christ will be exalted in my body, whether by life or by death. For to me, to live is Christ and to die is gain. If I am to go on living in the body, this will mean fruitful labor for me. Yet what shall I choose? I do not know! I am torn between the two: I desire to depart and be with Christ, which is better by far; but it is more necessary for you that I remain in the body. Convinced of this, I know that I will remain, and I will continue with all of you for your progress and joy in the faith, so that through my being with you again your boasting in Christ Jesus will abound on account of me. What is the journey we need to go on to become more? Our dreams will disappoint us and we pull back so we won’t go through that again. – Many of us tried hope and love and it didn’t work. It left us empty. – Many of us have wounds from failure. You are limiting the opportunities for the life God created you to live if you are not moving forward with expectation and hope. – Paul expects to need courage because he knew his future was going to have hardship. Raise your expectations to what you expect. Too many of us have more expectations of life than of ourselves. Those of us that expect life just to happen will naturally gravitate toward the lowest point of existence possible. You will move toward mediocrity. You need to make choices for life to happen. Why trust Jesus if life is going to be hard? Because life is hard and full of challenges. – You shouldn’t just expect great dreams but also that great pain will come with your life. Expect to need courage. If you angry with God that your life is hard, ask yourself what did you expect? – God sees pain as a temporary condition in your life. We have more science on how to live longer, what we really need more of is how to live well. To live is Christ, to die is gain. Paul is torn on what to choose – life or life. People that are afraid to die are afraid because they have never lived. Expect to live. God has another life for us on the other side of pain and suffering. God placed you on this earth for intention and purpose. – You can still have joy and happiness while living with intention. Happiness comes from a life that matters. Too many of us live our lives conformed to the expectations of others. Break free. At some point you have to stop saying “God, what about me?” and say to God “use me for the sake of others”. Live life to your last breath saying, “I have no regrets. I gave it all”. Now the people of Judah approached Joshua at Gilgal, and Caleb son of Jephunneh the Kenizzite said to him, “You know what the Lord said to Moses the man of God at Kadesh Barnea about you and me. I was forty years old when Moses the servant of the Lord sent me from Kadesh Barnea to explore the land. And I brought him back a report according to my convictions, but my fellow Israelites who went up with me made the hearts of the people melt in fear. I, however, followed the Lord my God wholeheartedly. So on that day Moses swore to me, ‘The land on which your feet have walked will be your inheritance and that of your children forever, because you have followed the Lord my God wholeheartedly.’ “Now then, just as the Lord promised, he has kept me alive for forty-five years since the time he said this to Moses, while Israel moved about in the wilderness. So here I am today, eighty-five years old! I am still as strong today as the day Moses sent me out; I’m just as vigorous to go out to battle now as I was then. Now give me this hill country that the Lord promised me that day. You yourself heard then that the Anakites were there and their cities were large and fortified,but, the Lord helping me, I will drive them out just as he said.” Then Joshua blessed Caleb son of Jephunneh and gave him Hebron as his inheritance. So Hebron has belonged to Caleb son of Jephunneh the Kenizzite ever since, because he followed the Lord, the God of Israel, wholeheartedly. (Hebron used to be called Kiriath Arba after Arba, who was the greatest man among the Anakites.) Then the land had rest from war. Everything God started inside of you, he wants to finish through you. Many of us have deep regrets because of things left unfinished by us. We say things like “if God wanted it to happed, it would have happened”, when in reality we quit. Caleb never quit and finished well. Joshua blessed Caleb by giving him the land that was promised to him – a land that still had giants in it (v. 13). He blessed him by giving him another battle to step into. Caleb knew he wasn’t finished yet. God’s blessing doesn’t mean he gives us peace and rest. The Israelites were satisfied with just quitting and existing. God wants people that are willing to say, “I’m not finished yet”. Too many people show up to church and are satisfied with just sitting in the chairs. What matters enough for you that it doesn’t matter what anyone else thinks or says about you for you to take a stand in life? The Last Arrow isn’t about self-fulfillment. It’s about self-sacrifice for the needs and benefits of others. What matters more to you than your life? Many of us love to step into opportunities that we think will give us a better future. Opportunities are big in the beginning and in the end, but skinny in the middle and that’s when most of us bail out (the part that requires discipline and perseverance). Believe that your suffering and determination and your wounds are needed by God to accomplish his will. Imagine if Jesus didn’t go to the cross after his suffering in the garden? Jesus decided he wasn’t finished until it was finished (his final words on the cross). God wants to use people that are willing to say, “I’m not finished yet”. You can retire from your job, but you can’t retire from your intention. If you are still breathing, you are not finished. Let’s redefine what it means to get older. When you are young, you are stronger. But when you get old, you get wiser. You know how to believe, pray and sacrifice. You don’t need to be younger, you just need to be alive. If you want to live a life without regret, then start now. Because if you don’t learn how to sacrifice when you are younger, you won’t do it when you are older. So stop talking about what your past was like and start talking about what your future is going to be. 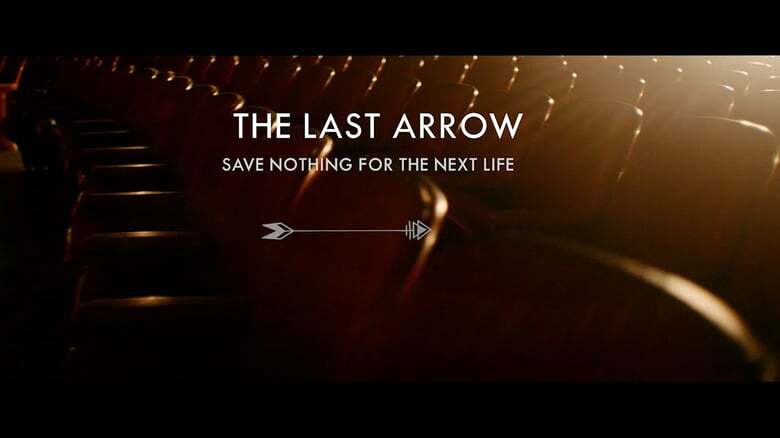 The concept of The Last Arrow came to me when I was reflecting on a story from the life of the prophet Elisha in the Hebrew Scriptures. In this story, Jehoash is the king of Israel in the midst of a massive war, and he seeks the wisdom and counsel of Elisha in how to win against the armies of Judah. Jehoash strikes the ground three times before he stops and, quite unexpectedly, Elisha grows angry with him. ‘You should have struck the ground five or six times; then you would have defeated Aram and completely destroyed it. But now you will defeat it only three times.’ And that is where the story ends. Jehoash began with the promise of a complete victory and afterward found himself the recipient of much less. And it all centers around one decision: he struck the ground three times and then stopped. To put it another way, he quit. For Elisha, Jehoash striking the arrow was connected to his ability to receive the full measure of God’s intention for him, and when he quit the victory was lost. It makes me wonder how many times in my own life I thought I failed, but actually the only thing that happened was that I quit. When you come to the end of your life, will you be able to say, “I gave everything I had,” or will you have a hollow feeling inside of your soul that you quit too soon, that you expected too little, that you did not strike the last arrow? Make the commitment to not stop before you are finished, because you are truly stopping before God is finished. Are there areas in your life where you too easily give up? Can you identify patterns in your past where you thought you failed when you actually quit? What makes you want to be a person who lives their life fully alive and dies with their quiver empty? In 1977 my family’s home erupted in an electrical fire that consumed everything inside. While my mother lamented the loss of my brother’s trophies and promised him they could be fixed, I remember that my brother seemed strangely unmoved. The insight he left me with that day was that if those trophies are the highlights of our life, then our lives were not worth living, going forward. Why waste time and effort to reclaim the past when it would be much better for us to focus on creating the future? There are things and even people that you will have to leave behind if you are going to keep moving forward – anyone and anything that would keep you trapped in the past and would rob from you the future God has for you. Jesus clearly imparted to all of His disciples: You cannot follow me into the future if you are holding on to your past. Your past will be your future until you have the courage to create a new one. Take every memory that continues to wound you, take all of the pain, all of the regret, take all of the bitterness and disappointment, take all the moments of betrayal and every failure out of your heart and put them in the fire. Keep in mind that this is not an invitation for destructive behavior; don’t burn relational bridges or operate under a scorched-earth strategy. Try to make sure you do the right thing in the right way; appreciate the past, but live in the present and for the future. The journey into our best future always passes through the furnace. The fire both forges us to who we must become and frees us to live the life for which we were created. What has a negative hold on your life that you need to leave in your past to create your future? Identify three strongholds over your decisions, behaviors, and relationships that you need to ‘burn’ to move forward into the life Jesus is calling you to live. When Jesus’ disciples went to the tomb to look for his body, the angel who met them asked, “Why do you look for the living amongst the dead?” In general, we seem so confused about life and death and even more so about the ambivalent state of being that might best be described as existence. Not long ago my wife Kim and I were in Beirut. We were preparing to go into Bekaá minutes from the border where ISIS was at war with the people of Lebanon. As we were about to jump in our cars we were asked to fill out a form. The forms’ heading read ‘Proof of Life.’ This was the first time in my life I was asked to prove I was alive. This caused me to reflect and ask myself, “What are the proofs of my life?” Is it the car I drive? My last name? My social security number? Could it be that those descriptors are not proof of life but simply proof of existence? Most of us are not choosing between life and death; we are choosing between existence and death. We actually never choose to live. We are paralyzed by our fear of death and all its relatives such as failure, disappointment, and heartbreak and that fear leads us to trade life for existence. Of this I am certain: whatever God has for you, whatever promises God longs to fulfill in your life, whatever riches may await you, you will only find them when you choose life over existence. Regardless of your status or socio-economic background you must stop waiting for someone to make your life count. You must act. You need to act like your life depends on it. Whatever choices you make in life, no matter how much you accomplish, one thing is certain – all of our lives will end. The question still remains: will you choose to live or will you lie there until death takes you? What are your proofs of life? What are those things in your life that make you come alive? In what ways have you settled for existing instead of living? Usually when we read a story like this we are primarily struck by the outcome – it’s no small thing that at the end of that story Jesus gave the two blind men their sight. So the question Jesus asked often goes over looked. When Jesus asks them “What do you want me to do for you?” he wasn’t asking because he didn’t know, but because he needed them to declare what they wanted God to do on their behalf. The Psalms tell us that we are to delight ourselves in the Lord and he will give us the desires of our heart. This means we need to know our hearts, we need to know our desires, and we must allow those desires to be informed and then formed by our love and worship of God. If you don’t know what you want, then God trying to give you what he wants is a wasted effort. You have to want what God wants in order to receive what God wants to give you. There are times in life when it is not within the scope of God’s intention for our life to give us certain things we ask for. But wouldn’t you rather err by asking for too much than too little? What do you want from God? Is that a question you typically ask yourself? Is there anything you want that you’re afraid to ask for? At age 29 I had been the pastor of a tiny congregation in South Dallas, TX for six years. A huge faith-based event took place in Reunion Arena every year and I typically volunteered there as, essentially, an usher. Right before the event was scheduled to start, the executive director of the conference came to me and told me the main speaker couldn’t make it and that I would take his place. It took a lot of convincing from him to make me believe he wanted me to step onstage in front of 20,000 people in less than an hour. That night I gave every ounce of passion within me, but it wasn’t because I was in front of thousands. It was the same intensity I gave every week to the 20 or 200 people who walked through the doors of my church. Afterward, the director told me that he had seen me preach in Spanish at my church without my knowledge – he didn’t know what I was saying, but he knew what was happening in the room and trusted me with a large moment because of that small one. Remember that Jesus laid out this principle for us: it is the person who is faithful in the small things who will be entrusted with bigger things. So many of us are trying to get “there,” wherever “there” might be. But when we get there, we’re not ready for it. The great tragedy would be to live your life waiting for that moment to come instead of living your life preparing for when that moment comes. What I have seen over a lifetime is that, from our perception, we wonder why God hasn’t given us the opportunities we long for, and from His perception, He wonders why we chose to be unprepared for the opportunities He placed right in front of us. You cannot know every challenge you will face, but you can know who you are when you face that challenge! Are there areas in your life where you feel God has called you to prepare yourself for something larger? How has God rewarded your stewardship of small things with the trust of larger ones? This verse shows the correct response of someone who understands God’s crazy relentless love for us. I will admit I wasn’t a huge fan of this chapter. The majority of the chapter is Francis Chan describing a list of lukewarm Christians. The list goes on and on. So was my frustration because the chapters drags on too long or because I saw myself in this list? I definitely know I’m not the perfect Christian. The chapter gives some valid points on how lukewarm Christians can be a distraction to those who want to sincerely follow Jesus. I have the same frustrations with Pastors and churches that are more concerned with numbers and preaching a “seeker friendly” message to attract viewers or with Christians whose faith is just for show. Jesus spoke in parables to weed out those who weren’t interested in the truth of the gospel (not because He didn’t care about them). I think for me, I don’t want to just be living for God out of conviction or to live up to a standard. I don’t want a desire to just be “good enough”. All I have to do is think back to when God rescued me and how patient He has been with me since then to know He loves me. I want to pursue God with my whole being and have all my actions flow out of a heart for Him. I know the only way to live this life for God (and not of one who is half-hearted) is to truly love Him. I pray everyday I am in awe of how great and how good God is.